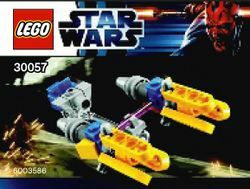 30057 Anakin's Pod Racer is a Star Wars set released in 2012. The main body/cockpit section of the racer is made of of light grey and blue parts, which connect into the front engines section by a transparent clear part. The engines are made of a grey back section, a blue middle, and yellow prongs at the front. A purple part connects the two engines, and a clip piece is attached onto it, connecting it into the transparent element that connects the engines to the body of the racer. Anakin Skywalker built a podracer in secret on Tatooine, and won the Mos Espa podrace, competing against Sebulba. It is to the same scale as Sebulba's pod from 9675 Sebulba's Podracer & Tatooine. Facts about "30057 Anakin's Pod Racer"